Metal IBCs are made up of stainless steel or carbon steel and are used for cross border bulk transportation. Metal IBCs have emerged as a crucial element of growth of cross border trade practices especially for end users such as industrial chemicals. Metal IBC have led to significant minimization of snapping and spillage cases of the bulk liquids due to which they have gained immense strategic significance. Additionally, the global metal IBC market is driven by the increasing manufacturing sector output and trade activities that requires the need of containers for exports and imports. The global metal IBC market is envisaged to witness growth at a CAGR of 4.1% for the forecast period 2017-2027. In 2017, the market had secured a valuation of US$ 1,334.4 Mn. However, by 2027, it is envisioned to reach US$ 1,995.0 Mn. Containerization has led to significant low costs for the shipping industry which has further propelled the demand of the global metal IBC market. A key trend prevailing among the multinational players operating in the global metal IBC market is the use of RFID technology to track and trace the IBCs to save cost as well as enhance customer service. On the basis of material type, the global metal IBC market is segmented into stainless steel and carbon steel. Stainless steel has high market share and growth rate as compared to carbon steel due to its better wear and tear properties as compared to the carbon steel IBCs. On the basis of design type, the global metal IBC market is segmented into cubical and cylindrical wherein both the segments are further sub segmented into flat bottom and conical bottom. Cubical flat bottom segment is expected to account for a major market share as compared to the cylindrical segment. On the basis of content type, the global metal IBC market is segmented into liquids and solids and semi solids segment. Liquid segment accounts for a major revenue share as the intermediate bulk containers are mainly employed for the liquid transportation. Liquid segment is expected to account for a market revenue share of more than 85% by the end of 2027. On the basis of technology, the metal IBC market is segmented into aseptic and non-aseptic technology. Aseptic technology is forecasted to continue its dominance during 2017-2027 expanding at a CAGR of 4.2%. Global metal IBC market on the basis of end use is segmented into industrial chemicals, paints, inks, and dyes, food and beverages, petroleum and lubricants, waste disposal/recycling and silage, building and construction, and pharmaceutical and others. Industrial chemicals segment accounts for a major chunk in the global metal IBC market. Among the industrial chemicals sub segment, metal IBC are mainly used for the transportation of hazardous chemicals. The hazardous chemicals segment is expected to expand at a CAGR of 4.5% during the forecast period. Lastly, on the basis of region, the Global Metal IBCs market has been segmented into North America, Latin America, Middle East & Africa, Europe, and Asia Pacific. North America Metal IBCs market is estimated to constitute the highest market share in the global region followed by Europe. 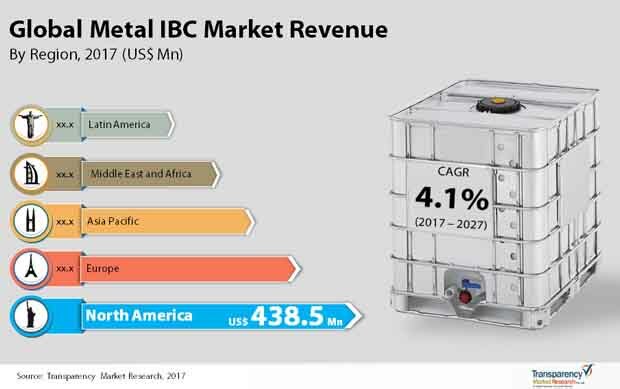 Metal IBCs market in Asia Pacific is expected to witness comparatively higher CAGR over the forecast period, 2017-2027. However, the rising demand for advanced transportation options for emerging end users such as the food and beverage industry and waste disposal is likely to enable steady dominance of North America in the global metal IBC market in the coming years. Leading players in the global metal IBC market include Thielmann US LLC, Hoover Ferguson Group, Precision IBC, Inc., Snyder Industries Inc., Custom Metalcraft Inc., Time Technoplast Ltd., Metano IBC Services Inc., Sharpsville Container Corporation, Automationstechnik GmbH, Yenchen Machinery Co. Ltd., Transtainer, Pensteel Ltd., Titan IBC, Plymouth Industries, Hawman Container Services, CLA Containers Ltd., SYSPAL Inc., La Garde, and Acura Group. The global metal IBC market is likely to be intensely competitive over the coming years due to growing commercial prospects of the sector and the rising number of players carving out sizable shares in the global market. The global metal IBC Market is chiefly driven by containerization of consumer products which leads to ease of transportation and cost optimization. The rapidly evolving cross-border trade among several developing nations as well as increasing demand for sophisticated solution of bulk liquid transportation has led to a high demand for containerization which in turn is driving the global metal IBC market. Containerization has eased the transportation of products for the shipping industry at cost-effective rates. Intermediate bulk containers boost productivity by enhancing proper stacking as well as improving the efficiency of warehouse management. According to TMR the global metal IBC Market will rise from US$1,334.4 mn in 2017 to US$1,995.0 mn by 2022, expanding at a 4.1% CAGR from 2017 to 2027. This market is driven by support from governments of various economic powerhouses in China and India which aims to double the volume of trade in the coming few years. The manufacturing cost in India and China is extremely low which has tempted manufacturers from across the globe to shift their production facilities in these nations in Asia Pacific. This has led to a growth in the trade volume in Asia Pacific and is also driving the metal IBC Market in the region. One of the key challenges faced by the global metal IBC market is the availability of low-cost alternatives. Cheap transportation solutions such as flexible IBC and plastic IBC are restricting the growth of the global metal IBC Market. However, the improving infrastructure across emerging nations will act as a growth opportunity for the metal IBC market. In addition to this, the emergence of intermodal transportation will also drive the growth prospects of this market. On the basis of technology, aseptic technology is leading on account of the highest standards of hygiene it maintains. Aseptic technology is used extensively for the manufacturing of metal IBC's. On the basis of end use, the industrial chemical segment is expected to lead and be worth US$852 mn by 2027. On the basis of geography, the global metal intermediate bulk container market is segmented into Asia Pacific, Europe, Latin America, North America, and the Middle East and Africa. Of these, Asia Pacific is anticipated to expand at a comparatively faster pace and exhibit a 4.9% CAGR while North America is at present the most lucrative regional market. It is anticipated that the North American metal IBC market will be worth US$621.7 mn by 2022 driven by increased demand for advanced transportation from waste disposal and food and beverage sectors. Europe is trailing North America in terms of leading in the global metal intermediate bulk container market. The global metal intermediate bulk container (IBC) Market is extremely fragmented with just 5% of the total share being held collectively by the top ten companies in the year 2017. Leading companies in the market are: Thielmann US LLC, Precision IBC, Inc., Hoover Ferguson Group, Snyder Industries Inc., Time Technoplast Ltd., Custom Metalcraft Inc., Metano IBC Services Inc., Automationstechnik GmbH, and Sharpsville Container Corporation.